Aroy Dee Thai Kitchen used to be at Sunshine Plaza but it has since moved to a new shop diagonally across on Middle Road. The Steamed Seabass in Thai Sauce (S$28) is pretty decent, but we prefer the one from Thai Tantric (read #10 below). You can get the classic Thai dishes such as Green Curry Chicken (S$10) Tom Yum Talay (S$10), Som Tum (S$7). But the Pineapple Fried Rice with Chicken Floss (S$6.50) is a must-order dish here. Beerthai House Restaurant at Golden Mile Tower offers a selection of affordable Thai main dishes, desserts and drinks. Beerthai House Restaurant’s Tom Yum Soup (S$12+) was a favourite among all the dishes that we had tried. Other items on the menu you can look forward to are the Stir Fried Pork Garlic with Rice (S$7+), Pork Leg Rice (S$7+) and Thai Steam Boat (S$7+). 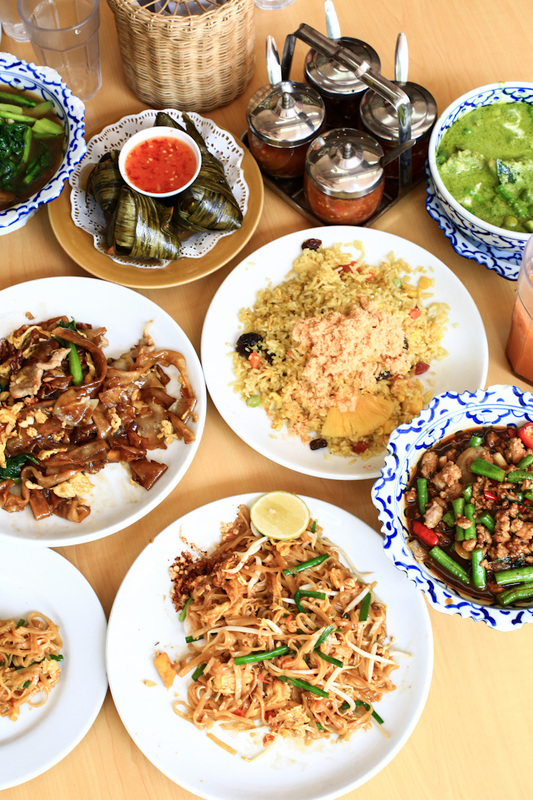 No lack of Thai food options when you are at Golden Mile Complex – aka Little Thailand in Singapore – but the all-time gold is Diandin Leluk Thai Restaurant. Its menu is comprehensive and nothing is overly expensive. You may take a while to decide on what to order, but let’s just say you need to have their Phad Thai (S$4) and Thai Mango Salad (S$6). First Thai restaurant is an old steward that sits on Purvis Street. 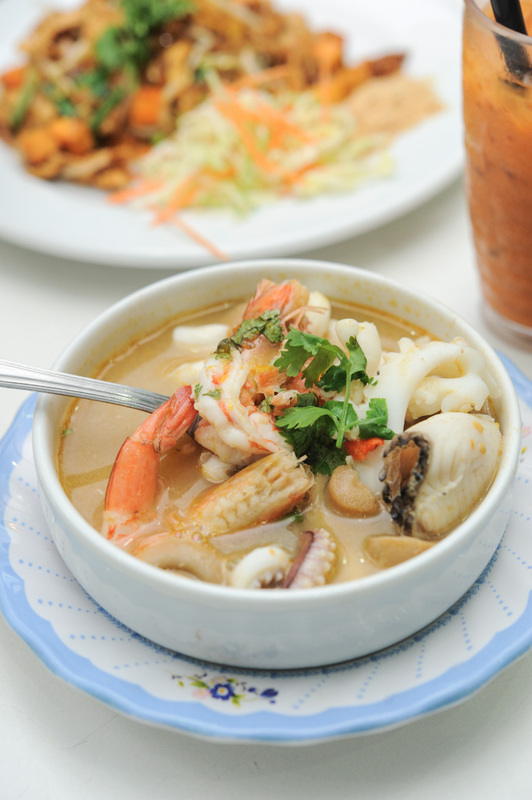 It is one of the more well-known no-frills Thai Restaurants, and the Tom Yum Seafood (S$7) is a must-order. Nothing else in particular stood out though, but you can consider their Olive Fried Rice (S$8) and Fried Prawn Cake (S$3/pc). 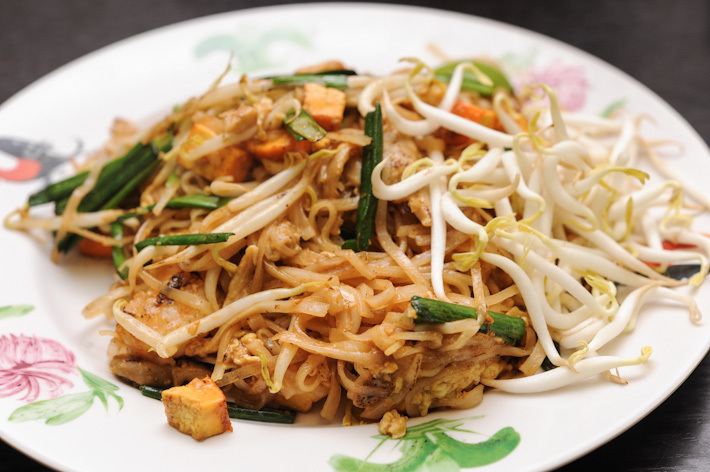 Jai Thai is listed in our guide to Singapore’s top 10 inexpensive restaurants. Orchard Towers is definitely not the best place to step in to, but if any, we would go there for Jane Thai. Sleazy as the building may be, any time is a good time for Thai food here. 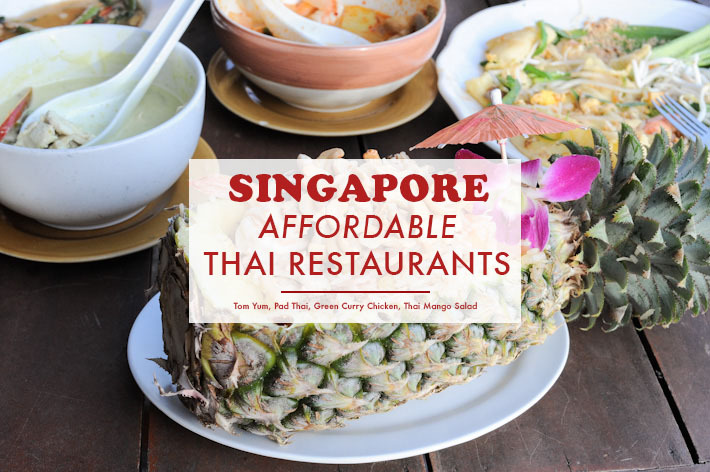 They serve a comprehensive selection of Thai food and you can find anything from Thai Salads (S$8 – S$12), Curries (S$10), Seafood (S$12 – S$18), and Meats (S$8 – S$10). 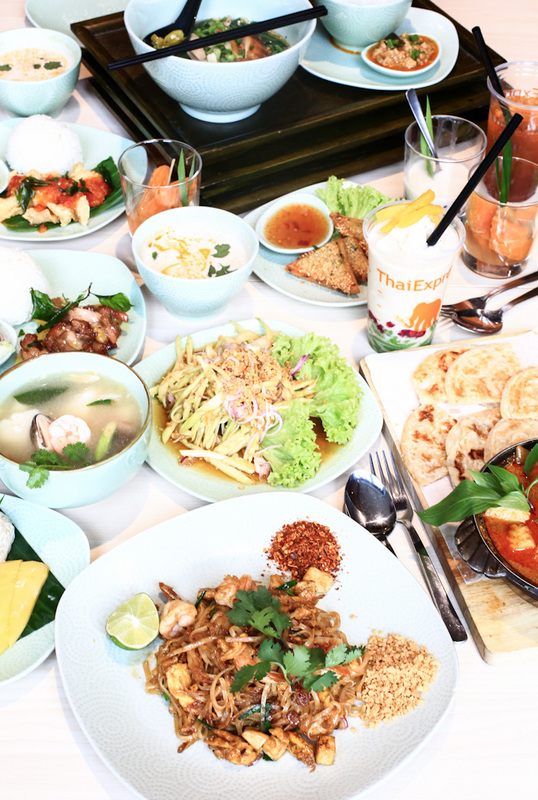 Jane Thai is listed in our guide to Singapore’s Top 10 budget restaurants in Singapore. This is undoubtably a hot favourite. Nakhon Kitchen sees long queues every single day, and it is no surprise because they are known for dishing out very authentic Thai food at pocket-friendly prices. 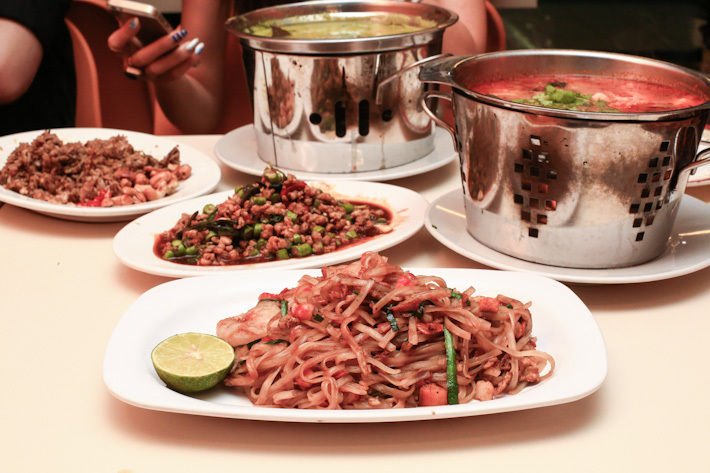 Our picks include the Thai Style Fried Kway Teow (S$4), Stir-Fried Mince Pork with Basil ($6) and Green Curry ($8) – one of the better renditions in town. 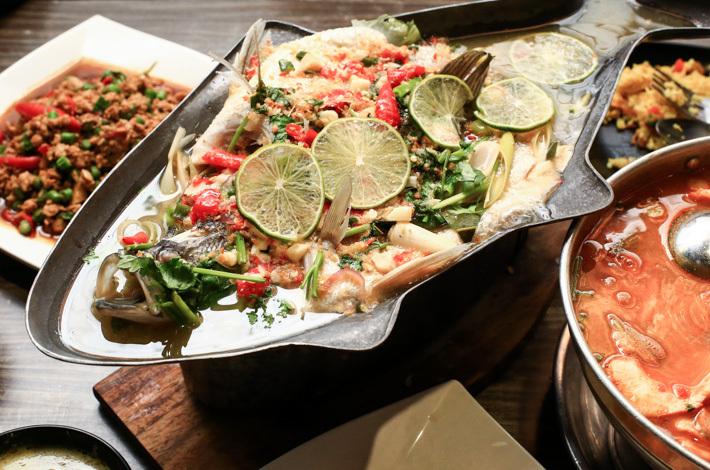 Nakhon Kitchen is listed in our guide to Singapore’s Top 10 budget restaurants in Singapore. 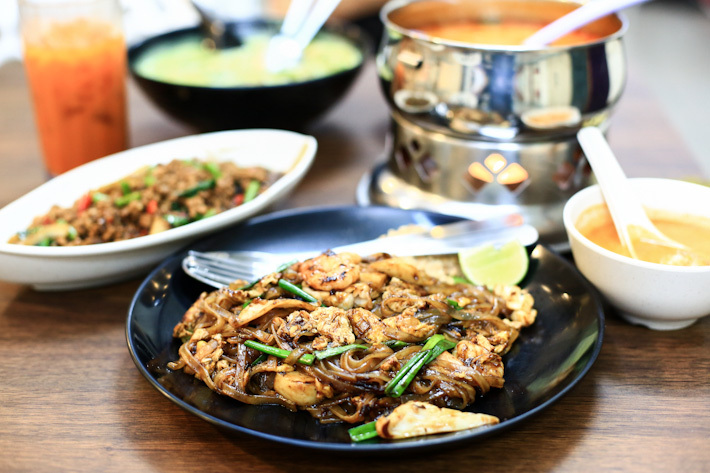 A popular haunt at Sunshine Plaza, Thai Gold Food offers simple and satisfying Thai food at extremely reasonable prices. From Mango Salad, to Tom Yum, Green Curry and Mango Sticky Rice, everything at this small and slightly run-down Thai eatery is cooked just right. The Drinking Market at East Coast Road has good thai food!… even though they don’t sound like they serve thai food. haha. Real good and super affordable! Why bother going out of the way to places like Golden Mile Complex if you’re just gonna eat entry-level stuff like Pad Thai and Tom Yum? Try Ruby Thai at Marina Square, it’s really good too! Please try chang thai at bishan blk 151. They have good food and very affordable too! 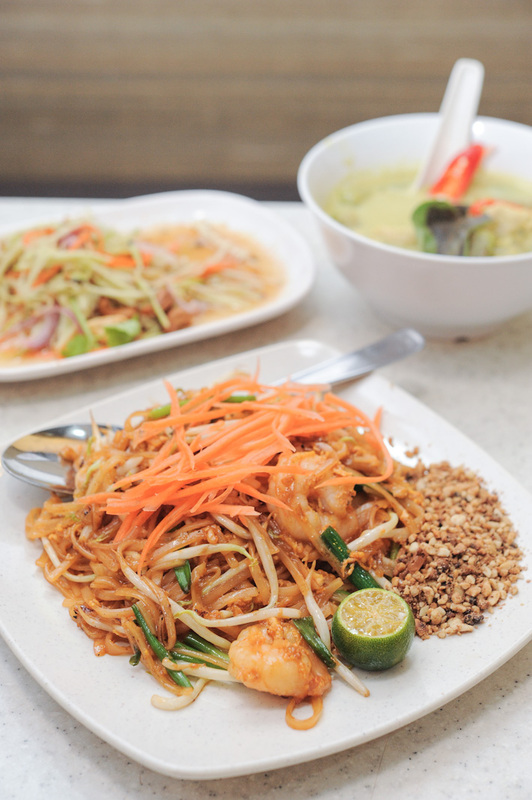 Try spicy thai – thai cafe at aljunied. Certainly one of the best thai food traditional and twist of local flavor! The basil inn at downtown east gets my vote for serving the freshest most delicious spicy sour lemon steamed fish ever. The basil pork and clear tom yum is super authentic as well. Prices are definitely cheaper than those at golden mile. Bangkok Thai Food at Beauty World Food Centre is worth mentioning too! Ah Loy Thai at Shaw Towers didn’t make it to the list?? Why??? You may want to check them out too. It’s really worth a shot (: Their quality is good and the prices are reasonable. Hi I recommend Bangkok DK Thai Food at Blk 125 Toa Payoh Lor 2 ( Braddell MRT exit). The steamed lemon seabass is superb! Other worthy recommendations include Kailan Beef Rice & BBQ Squid. Had a pleasant thai meal at Sinthai without having to lower the weight of my wallet. Im rather pickh when it comes to pineapple fried rice but Sinthai hits the bullseye of my palate. Their signature pork is a must try too. Bangkok Jam restuarant at raffles city basement 1 serve authentic thai cuisine. Come and try their tom yum fried ricr and salad.it was awesome delicious. Blk 308 Clementi Ave 4 Thai food is the best. Cheap and good. Aroy nah.